Okay, we’re getting to the end of this experiment and I’ve had exactly one person tell me to keep going with it. So this might be the end of it, unless I hear from others. 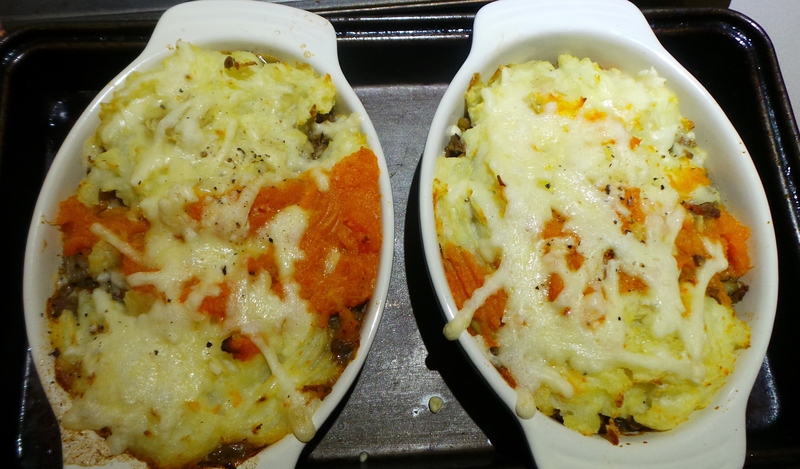 Anyway, this evening I finished the Cottage Pie that had been lurking in the refrigerator from the weekend. I also made a special dinner for The Boy. There has been half a bag of frozen prawns lurking in the freezer for some time now. He loves them (he cooked them up on the bbq) I thought they were truly awful. The smell was too much for me – and I love prawns. It was so very sad. Anyway, I thought I’d do him a dish with a few of his favourite things in… So, he had a Thai green curry (check!) with pumpkin (check! ), bok choy (check!) and prawns (and CHECK!). It all went rather swimmingly except for a brief interlude when I was interrupted by an important call and it started to catch. I thought I might have to bin it, but fought back the tears (his special meal! OMG! Nooooo!) and transferred it to a separate pan and carried on. So, I used the last of the pumpkin from the shop and cleared a little space in the freezer by using the prawns. The leftovers of the jasmine rice that I cooked to accompany it are now in the refrigerator for future use. Shopping for fresh vegetables tomorrow.